I have "trial" dotCover 1.0.1 (1.0.120.2), with VS2008, R# 4.5 (4.5.1288.2) and an old dotTrace 3.1 (build 355.1000). I dont believe I can go to R#5 yet, we have not paid for the licence, same for upgrading dotTrace. On the unit test sessions window, I see a dotTrace/profile button, but no coverage button. Is this a compatibility issue, do I need to uninstall or upgrade dotTrace? Can I just disable the R# integration to get dotCover working? When I select the dotCover | Cover Startup Project menu option, I get the attached error. Will try uninstalling dotcover, dottrace and resharper and then installer resharper 4.5 (in vs2008) and then dotcover - hopefully that combination works (and I am not out of my dotcover trial period). dotCover integrates with ReSharper 5.0 and above. 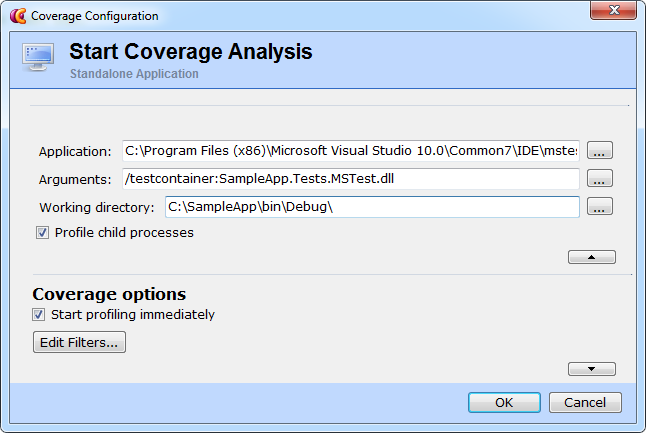 However even without ReSharper it's still possible to perform coverage analysis of tests executed by any external runner. See (dotCover -> Cover Application) in main menu. The reinstall did not help, and I guess not surprising given the above comment. Do I configure it to use a Standalone application to run the MSTests ? Silverlight, WebDev, Windows Service dont seem appropriate. Perhaps IIS App or .NET process is the way to go? I am testing an MVC app using using MSTest. I'm sorry for the delayed response. As it was mentioned in the email, dotCover integrates with ReSharper 5.0 and above. dotCover -> Cover Application -> Standalone application. - "profile child processes" option should be turned on. I'll send you a key with extended trial period by email. Please contact me if you'll have any questions. Many thanks for the detailed instructions. This worked great, I now have coverage info in VS.